Even I am amazed at the bounty that a pot of chicken broth produces–that’s why I make the effort to have it in my freezer at all times. As I stated in my last post, I made broth last week for risotto. It was a large pot of broth, so I was able to freeze several quarts, besides what I needed for the risotto. To recap, in my broth I used all legs and thighs and froze the meat in a separate bag. In my last post, I used some of the meat for a warm and comforting chicken soup. Tonight, I used the remaining meat to make a sauce for pasta. If you didn’t have a bag of dark meat chicken in the freezer, you could certainly use raw chicken thighs/legs in this sauce. Simply brown them lightly, then add the pureed tomatoes and cook the sauce for about a half-hour to 45 minutes, until the thighs are meltingly tender. For my sauce, I’m still working with fresh tomatoes, as long as our local tomato harvest holds out. 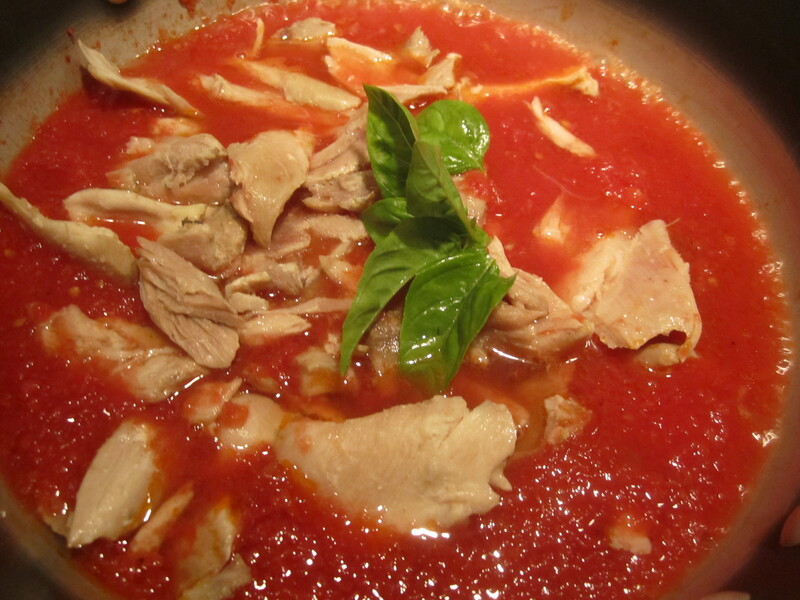 Simply cut the tomatoes into chunks and process them in the blender until a smooth puree forms. Then place in a saucepan with a couple of tablespoons of olive oil and a sprig of basil. Simmer for a mere 15 minutes to achieve the sweetest, freshest sauce you’ve ever tasted. Tonight, after simmering the tomato sauce for 15 minutes, I’ve added the chicken and simmered it for about 15 additional minutes. As a nod to the egg pasta, I’ve decided to add a touch of butter to my sauce, and use parmigiano cheese for sprinkling at the table (rather than the more traditional pecorino, which I normally prefer on tomato sauce). 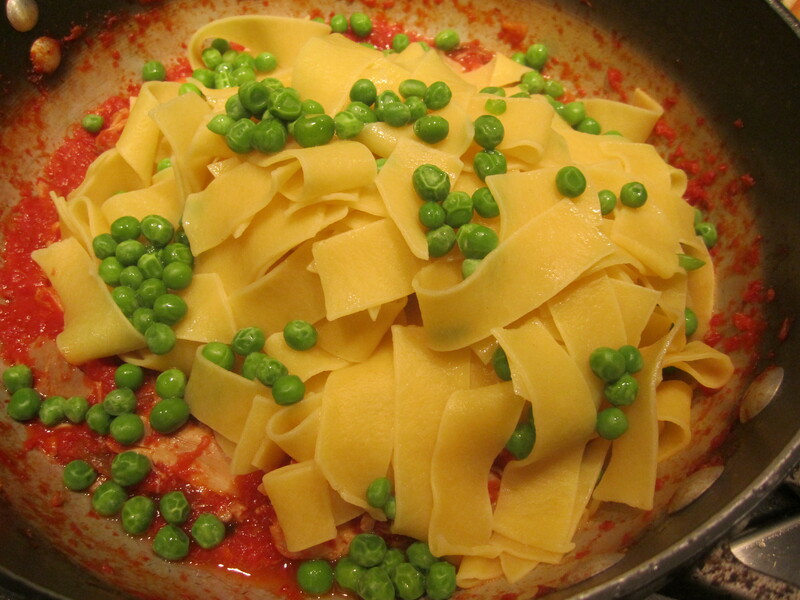 Peas make a naturally great addition to any egg pasta dish, adding sweetness and greenness wherever they go. 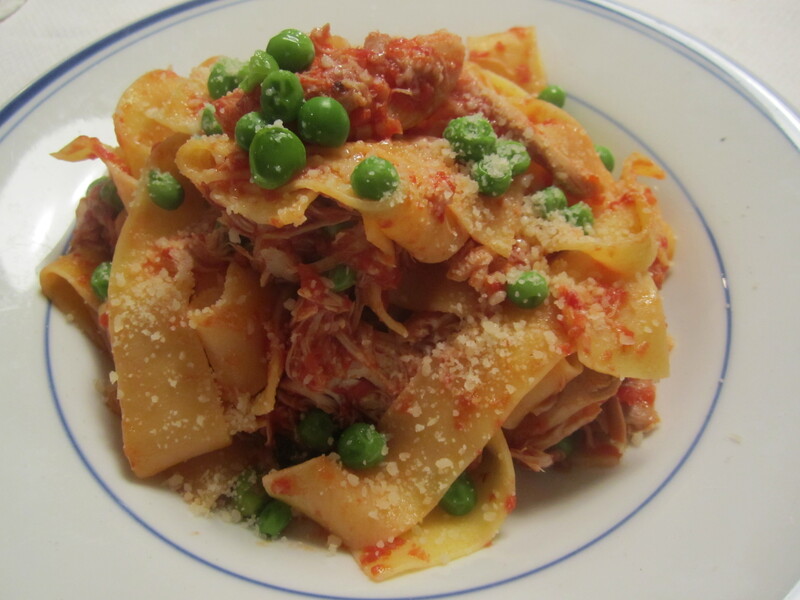 This is a delicate but hearty pasta, refined enough to serve to guests any night of the week! 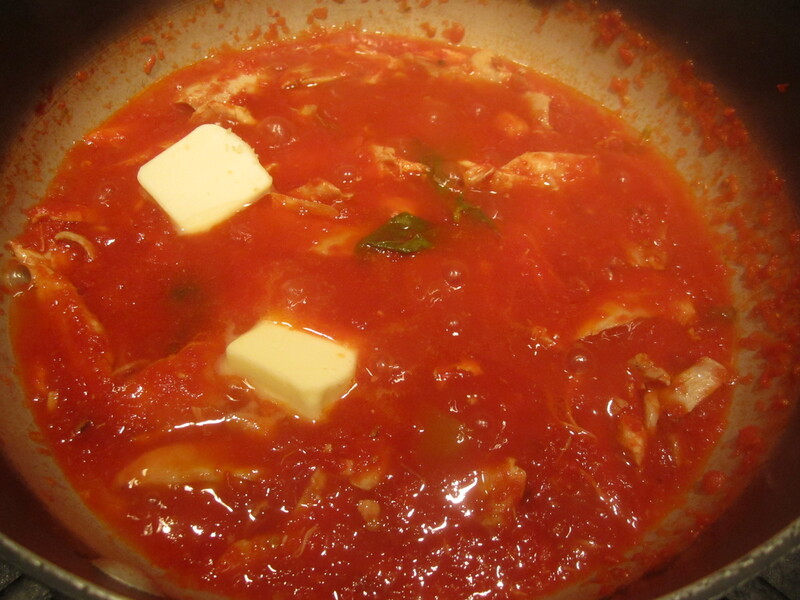 In a saucepot, simmer tomatoes with basil and olive oil on low heat for about 15 minutes. Add shredded chicken meat and simmer additional 15 minutes. Add butter and stir and simmer until pasta is cooked. Toss in cooked pasta with a cup of pasta cooking liquid. Blanch peas in remaining pasta water for a minute, then drain and add to pasta. Serve with plenty of grated parmigiano.